"Great topping for tacos--also a nice side dish for any type of Mexican or Tex-Mex entree! Hint: The measurements are approximate- I usually make this without any. You can use green or purple cabbage, or a combination of the two. Same goes for green or red bell peppers. For extra heat, use an additional jalapeno pepper." 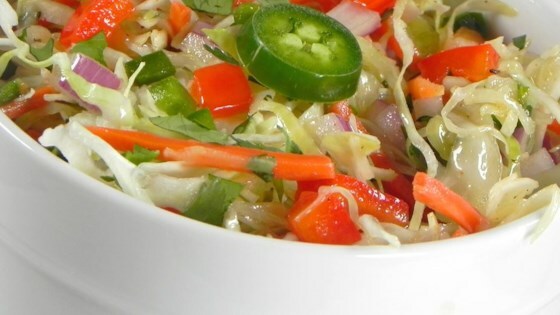 In a large bowl, toss together the cabbage, carrot, onion, red pepper, jalapeno and cilantro. Set aside. In a small bowl, whisk together the oil, vinegar, sugar, cayenne pepper, salt and pepper. Pour over vegetable mixture and toss to combine. Cover and refrigerate for at least one hour. This recipe is absolutely refreshing, crunchy and just plain delicious. Although, I mix shredded cabbage with a bag of broccoli slaw. This gives it an extra bit of crunch. Excellent side dish with my mexican main dishes. My family does not like cilantro so I added Schillings mexican seasoning which was excellent. Excellent recipe. I left out the jalapenos for fear my family wouldn't eat it and it was still spicy enough! Nice change to the standard coleslaw.